The National Show Horse (NSH) is a relatively new American breed whose registry was not founded until 1981. Representing the epitome of the modern day show horse, a National Show Horse was originally a combination of the best of two breeds: the Arabian and the American Saddlebred. Beginning in 2011, the National Show Horse expanded its influence and now accepts into its registry a horse representing a combination of Arabian and any other breed as long as the resulting offspring possesses a minimum of 50% Arabian blood. A typical NSH stands between 14.3 and 16.2 hands in height and can be grey, bay, black, chestnut, and even palomino or pinto in color. Due in large part to their natural upright carriage and lofty animated action, the National Show Horse is predominantly ridden saddle seat in English pleasure and gaited classes, or driven as a fine harness or pleasure driving horse. However, their inherent dynamism, athleticism, and willing disposition make this extremely versatile breed equally successful in a wide variety of classes, including hunter pleasure, Western pleasure, show hack, and dressage. The combination of beauty, stamina, agility, grace, charisma and flowing athleticism results in the versatility of the National Show Horse, a trait that underlies its popularity and makes the breed particularly appealing as a show horse with which every member of the family can become involved. 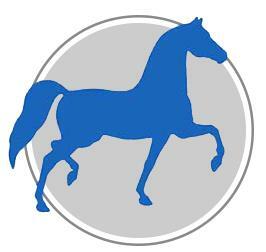 Since 1989, the purpose of the NSHR has been to promote the breeding and showing of the National Show Horse, to increase its popularity and participation within the general public through innovative programs, to maintain a registry with the highest standards of ethics and commitment, to promote youth and amateur programs, and to encourage and assist all levels of competition and local clubs.